Middle Creek Elementary will be collecting Box Tops, Campbell’s Labels for Education, Tyson A+ labels as well as utilizing Shoparoo, the mobile app for fundraising. 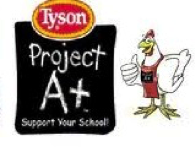 Box Tops for Education, Campbell’s Labels for Education and Tyson Project A+ is an easy way to raise money for student enrichment programs. By submitting these labels, we were able to raise over $2,500 last year!! Please send in these consumer products with your child in separate ziplock bags, labeled with your child’s name, teacher and track. We will have contests throughout the year for the top class on each track! Shoparoo is THE EASIEST way to raise money for MCES. The Shoparoo app is FREE and once you log in and choose Middle Creek Elementary School, take pictures of your store receipt and MCES will receive a monetary donation. please contact Angela Murphy at angela.m.murphy@live.com.